Is Oman famous for its deserts and dune bashing? 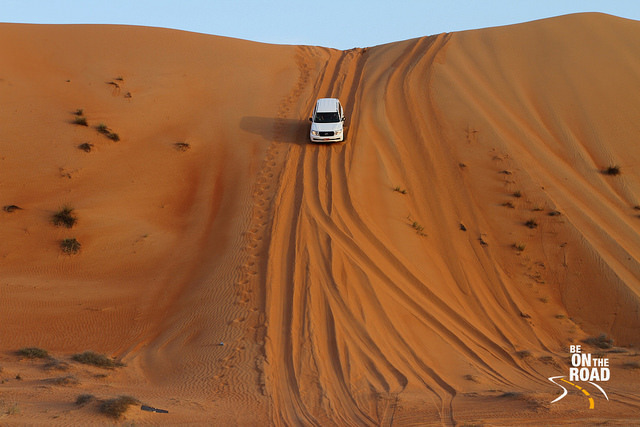 Not so much, but can you indulge in dune bashing and delightful desert activities? Of course, and since Oman is known for its diverse natural landscapes, one can do anything from snorkeling, taking dips in sinkholes, to dolphin and turtle watching, stargazing, and hiking. What’s even better is that Oman is suitable to visit in all seasons. When it comes to checking out Oman’s gorgeous, golden-hued deserts and dune bashing, it is always best to go in the cooler months, although even during the summer it can get quite chilly in the desert. The desert is known to be the dwelling space of the Omani Bedouins, who have different customs, traditions, fashions, and cuisine than the common folk—however, hospitality and kindness is a trait found in almost all Omanis. First, journey through the dunes closer to the capital city Muscat, starting off with Bowsher sand dunes that are not far from the beaches of Muscat and even within walking distance of the Sultan Qaboos Grand mosque. There is a golden hill that’s usually busy with those who enjoy sand biking and dune bashing with their 4×4. Within the area it is easy to find a spot to rent a bike or just climb the sand hill and watch the sunset. A two-hour drive out of the capital city will bring you to the sands of the A’Sharqiyah region, which is considered a camping hot spot, its sands known for the rich intensity of color. 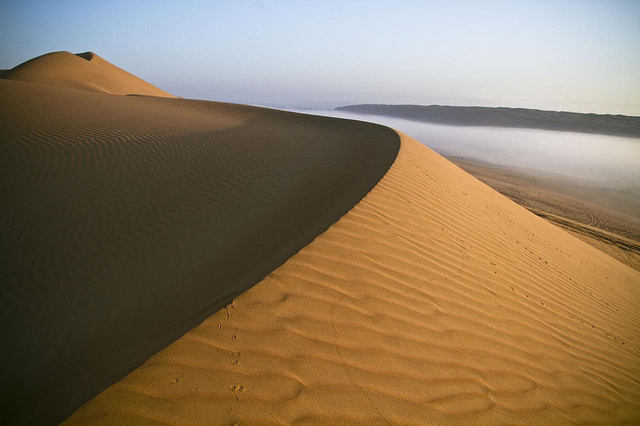 The desert is mostly known by its former name, Wahiba Sands, named after the Bani Wahiba community. One can buy handmade crafts or ride the camels of the Bedouins, which sounds like an epic desert adventure. Basically, Al Wahiba sands are one of Oman’s most popular destinations, and with many oases nearby it is quite the desert delight. A surprising amount of fauna and flora live in the area, despite it being a desert climate, and there are many tourist camps around the area, so it is quite easy to set up camp, spend the night, and watch the sunset and sunrise with golden dunes as the backdrop. Bidiya, a town in A’sharqiyah, is also popular for its sand dunes and is a great place for stargazing and camping. People of the town are known to raise strong, beautiful camels and horses. 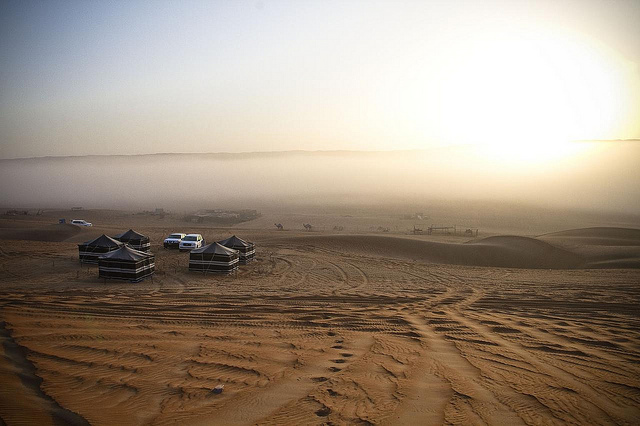 It is a vast, vast desert out there and there are many Bedouin-themed desert camp hotels around. We recommend The Deserts Night Camp or The Arabian Oryx camp. Both arrange a comfortable stay in the middle of the desert and take care of activities and your hunger. There are many guides readily available in Muscat and all over, which include tailored tours of the Wahiba sands and nearby attractions; check out this page for more information. Last but not least, we come to the Empty Quarter, or in other words, Al Rub’ Al Khali, which is the largest contiguous desert in the world and covers parts of the Sultanate, Saudi, Yemen, and the UAE. It is said that parts of the desert are still unexplored and uninhabited, as it is void of any oases. The Empty Quarter sands occupy the far northern part of the city of Salalah in the capital of Dhofar. 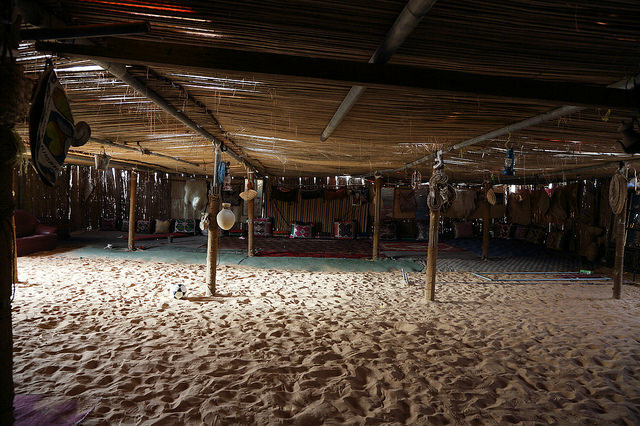 One can venture into Thumrait, a Bedouin settlement that was once an important trade outpost, then go further into the Empty quarter and be immersed in high golden dunes, some that go up as high as 250 meters. Then there is Ubar, a legendary ancient city that has been swallowed up by the desert as punishment from God. To sum up, no matter where you are in Oman, chances are you will find yourself on an unforgettable nature adventure.